Nico Hulkenberg does not expect to serve any grid penalties at the Brazilian Grand Prix as a result of his sizable crash at the start of Friday's second free practice session. Hulkenberg dropped a wheel on the grass at Juncao and whipped his Renault into the Armco barriers. 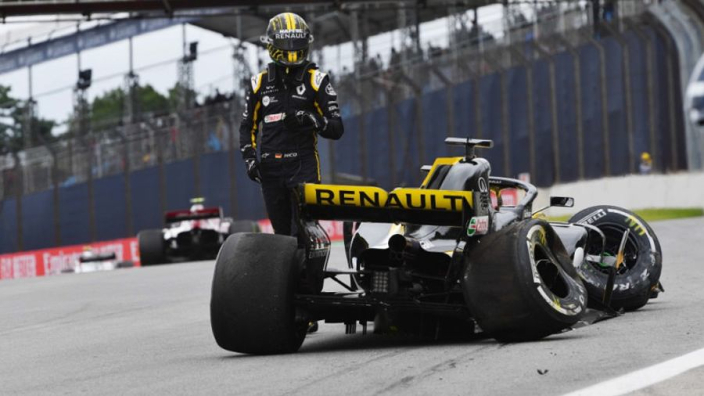 The German - who confirmed his gearbox and engine were unscathed, as he was - said he was "a passenger" during his venture outside track limits and said a small error had caused such large consequences. "I ran a bit too wide at the exit of the last corner," Hulkenberg said. "I took a little bit too much kerb there, wanted a bit too much probably. "The car bottomed out, and from there it was done, I was a passenger. Once I bottomed out, that pulled me off the track onto the grass, obviously no grip in the grass. "It was inevitable from there that I would hit the wall. "Happened pretty fast, small error but a lot of damage, so, yeah, not a great afternoon."